Yoga is a gentle physical therapy that involves the practice of postures and breath control as a natural way to help you relax and cope with a range of side effects and symptoms, during and post-cancer. Is there any evidence that Yoga helps people affected by cancer? In 2012, a systematic review of 23 clinical trials to date published in BMC Cancer reported cancer patients and survivors who practice yoga regularly had reduced fatigue, anxiety, depression, stress, improved quality of sleep, mood and better quality of life. Other studies have also reported improvements in symptoms such as pain, sleep problems and ‘chemo-brain’, as well as emotional and social wellbeing. Do I need to be super-fit or bendy to do it? Yoga is suitable for everyone, including complete beginners. Cancer patients and survivors with no previous experience can still do yoga and reap its benefits. The Star Throwers Hatha Yoga group is usually a small class of 4-6 people and runs every Thursday from 10.30-11.30am. It is led by our experienced Yoga teacher, Isabelle. We also have a second Forrest Yoga group starting on Tuesday February 26th 2019, weekly from 2-3pm. 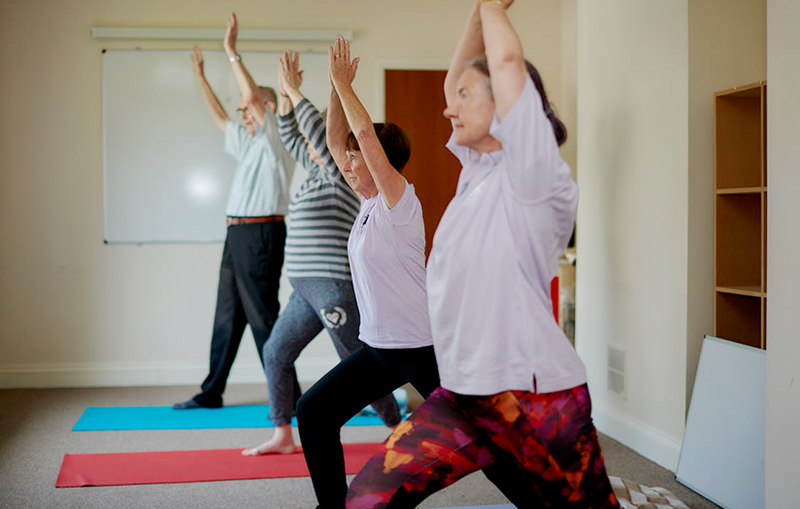 We also run a Gentle Movement and Relaxation group on Tuesday 12-1pm, run by instructor Kim. Please contact us on 01953 423304 or info@starthrowers.org.uk to discuss booking an appointment.